Well...we don't actually have it on hand, but I've cut a deal and my Dad is picking it up this week while he's in Coloma. 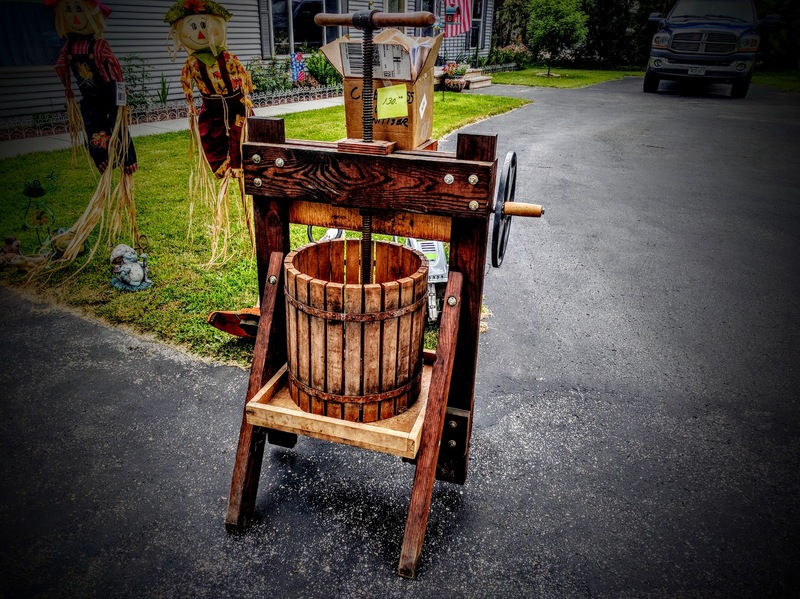 That's right, we're the proud owner of that beauty of an apple press. I found it at a yard sale up in Coloma and after passing on it initially, we went back later in the afternoon only to find it closed. The woman told me that they bought it from a farmer back in the 1970's but she had no idea how old it was. It has two parts: a grinder in the box (that's the wheel on the side) and the 22 lb press on top (that's the handle on top). Fortunately, the house was for sale, so I took a shot and emailed the agent with my story about wanting to reach the owner of the house she was selling to try to buy their apple press. Well...a few days later a lady calls me and....yada, yada, yada....we now have an apple press. (Or...we will have it this week when my Dad comes home from Michigan!). And...yes...I yada-yada'd over the good part. Who wants to come out to the suburbs for a good ole' fashioned apple pressin' one fall weekend?